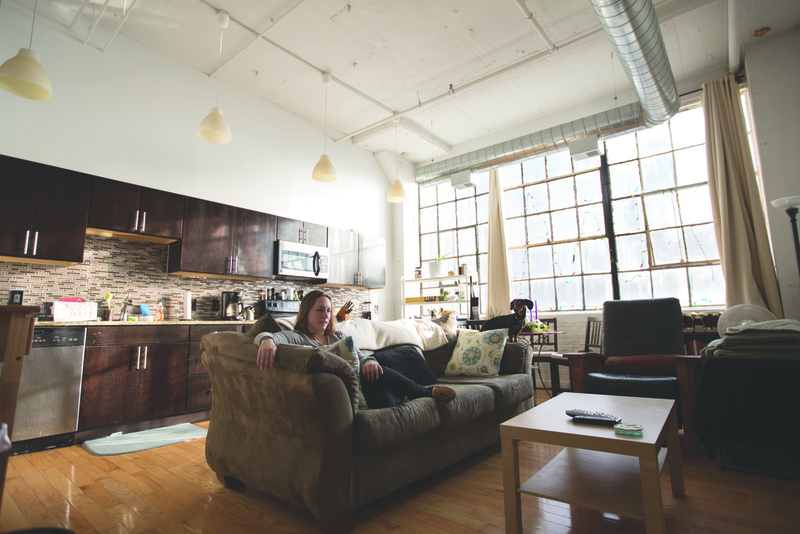 Krista Pleger enjoys her clutter-free apartment. 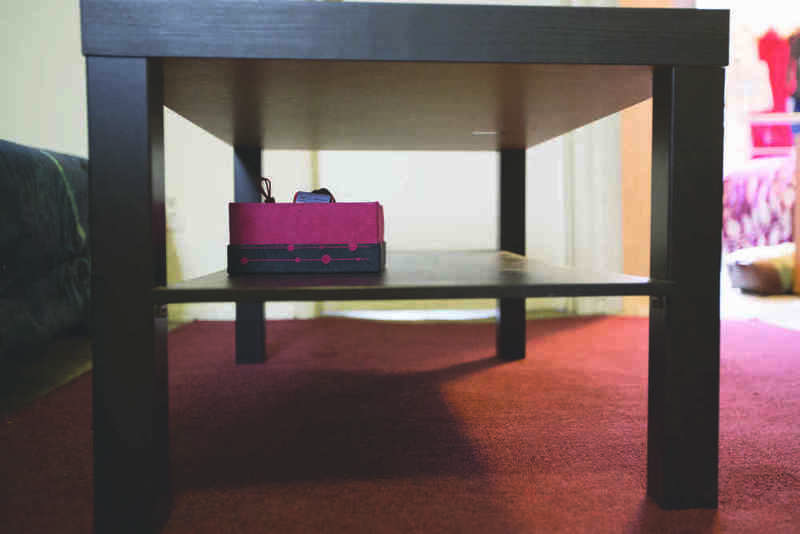 A table in the Bella Vista apartment of Susan Corcoran. The shared bathroom space of Art Museum resident Krista Pfleger. Krista's sink is on the right. The light-filled, West Philadelphia bedroom of Ayse Unver. Aaron Bitler's closet of wardrobe essentials. Susan Corcoran's living room furnishings. An empty closet becomes a unique architectural feature in the room of Ayse Unver. Aaron Bitler stands in front of his sparsely populated clothes closet. If this rack were in a retail store, you’d think it was going out of business. His winter wardrobe consists of five work shirts, three weekend shirts, two pairs of work jeans, a pair of weekend jeans, a winter coat, a fall coat, and—for special occasions—a sport coat and slacks. Three pairs of shoes are on a rack on the floor, and stacked one level above the shoes are his “house” and workout clothes. He owns three short-sleeve shirts, which are in the basement, and he keeps his socks and undergarments in a dresser drawer in his living room. Bitler, 40, a chemistry lab supervisor at the Philadelphia Water Department, recently got rid of his bed, so his mattress lies on the floor. There’s a book on the small table next to the bed, a copy of A Guide to the Good Life: The Ancient Art of Stoic Joy, a 2008 title by philosophy professor William B. Irvine. As far as “stuff” in that room goes, that’s about it. Bitler is among a growing number of people striving for a minimalist lifestyle, examining their possessions and systematically paring them down, sometimes to a jarringly utilitarian few. His 7-year-old son, Erich, begs to differ. Across the hall from his father’s barebones sanctuary is his room, a tsunami of two-foot-tall Tyrannosaurus rexes, Hess trucks with sirens and horns, Legos, papers and puzzles. “You can hardly walk from one side to the other,” he brags. It’s not the only untamed room in the house. The third floor contains Bitler’s comic book collection, and a boxed-up weight bench, which will be assembled when the room is eventually emptied. Bitler’s minimalism is a work in progress, and that’s why for the past year he has sought inspiration and support by attending meet-ups of minimalists around the city. If it seems like ridding yourself of unwanted items shouldn’t require a support group, consider these facts: The average American home has 300,000 items; U.S. children—3.7 percent of the world’s population of kids—have 47 percent of all manufactured toys and children's books. Not surprisingly, the containers for our possessions have grown as well. The average size of the American home has more than doubled since the 1950s, and despite our ever-growing square footage, one in 10 Americans rents a storage unit. The group, a local chapter inspired by the blog The Minimalists, was founded by Ayse Unver, 27, an urban planning and policy manager at Pennsylvania Horticultural Society. Unver grew up in Summit, New Jersey, an only child. Her home was—by her account—modest, with enough stuff in it to make it feel “lived in.” She recalls some tension among her, her mother and her father. He preferred a more organized environment, and she and her mother were frequent clothes shoppers. While Unver always felt a little out of step with society at large—she was voted “most non-conformist” in high school—it wasn’t until after she had already landed her first job and moved from a studio apartment to a three-room apartment that she truly began acknowledging the uneasiness she felt with the life she was leading. All of this acquisition, coupled with rent, meant that Unver wasn’t saving any money. It was concern for her financial future that pushed her to downsize her three rooms to one. But what to do with all the stuff she had accumulated? “When I realized how much stuff I had to move, that then drove me to the internet to ‘how to declutter your life.’” That led her to the The Minimalists blog, and she was soon poring over every word they said. The Minimalists blog was launched in 2010 by two childhood friends, Joshua Millburn and Ryan Nicodemus, who, in the past seven years, have radically changed their lives. In the first half of their 20s, prior to the site’s launching, they were living what many consider the American dream. They each had jobs that paid them six figures and were able to buy anything they wanted. But both were working 70- to 80-hour weeks, and despite the healthy paychecks, they were sliding into debt. When, in the same month, Millburn’s marriage ended and his mother died, he found himself facing some big existential questions, and he began to look at the role stuff played in his life. His conclusion was that he was freer without it. Months later, Nicodemus noticed a dramatic and improved change in Millburn and asked him, “Why the hell are you so happy?” When Nicodemus learned of Millburn’s possession shedding, he decided to follow suit. Together, they organized a “packing party,” where all of Nicodemus’ things were packed as if he were moving, and unpacked only as they were needed over a three-week period. After the time was up, Nicodemus found that 80 percent of his possessions remained in boxes. He sorted the remaining packed possessions into three categories: donate, sell and discard. The process hit a snag when he encountered a shoebox box full of sentimental items, including a photo of him and his girlfriend from a homecoming dance and emotionally packed letters from his mom written during a turbulent time. He found a solution. Stories like these that have earned the pair devoted readers and heavy web traffic—they claim four million people have visited their website. They’ve received media attention a rock star would envy, including features on ABC, CBS, NBC, BBC, NPR, TODAY, TIME, Forbes, The Atlantic, The New York Times, The Wall Street Journal, USA Today and National Post. “Minimalism: A Documentary About the Important Things” will be released in 2016. On an unseasonably warm November night at the Cosi on 12th and Walnut streets, a dozen or so people sit around a table, participating in the Philadelphia chapter of The Minimalists group. How, Grid asks, have your family and friends reacted to your decision to pursue a minimalist lifestyle? Yaeisha Slack, 30, a chemist who works with Bitler at the Philadelphia Water Department, agrees that the holidays can be tricky to navigate. Aspirational items can also be difficult to let go of. It can be painful to divest yourself of the unplayed guitar in the corner of the room, or the expensive paints and paintbrushes in the closet. Separating yourself from those items is akin to admitting that good intentions are not coming to fruition. While overcoming these obstacles requires a lot of mental fortitude, everyone fervently agrees that it is worth it. When asked if anyone ever regretted getting rid of something, everyone at the table shakes their head no. And the rewards seem to be many.